Six World Car Awards help open 2018 NY Auto Show. Volvo's Anders Gustafsson accepts the trophy for the World Car of the Year for the XC60. Volvo racked up another award for its expanding line-up of SUVs as the 2018 New York International Auto Show opened up its annual media preview. Already honored as North American Utility Vehicle of the Year, the Volvo XC60 expanded its reach by nabbing the title “World Car of the Year,” the most prestigious of six trophies handed out by a jury of 82 automotive journalists from around the world. The XC60 faced off against the Range Rover Velar, the British marque’s latest luxury-range utility vehicle, along with Mazda’s more mainstream CX-5. 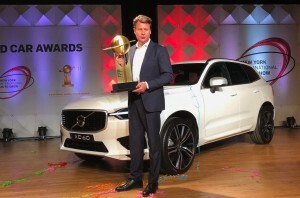 Volvo already nabbed another World Car award, the new Person of the Year trophy presented to its global CEO Hakan Samuelsson during a ceremony at the Geneva Motor Show earlier this month. Ralf Speth, CEO of Jaguar-Land Rover, celebrates a win for the Velar as World Car Design of the Year. It was a finalist for the overall World Car of the Year. The World Car program is unusual in that it considers vehicles from all major and minor markets, some of which aren’t available in places like the United States, so some of the finalists, such as the Suzuki Swift, drew puzzled looks from attendees at the ceremony at New York’s Jacob Javits convention center. Others are industry mainstays, with some models having won World Car Awards in years past. Vehicles in the Urban Car category may not have quite the flash of some the models, officials with the awards program noted, but as more and more motorists move into cities, it is becoming a class of products with increasing importance. The Volkswagen Group fared well this year and even had the three finalists in the World Luxury Car category. But, in the end, the new Audi A8 bested two models from sibling brand Porsche, the Cayenne and the latest-generation Panamera. Audi planners noted that the A8 is the first in a wave of all-new luxury models they plan to introduce over the coming year. In the Performance Car category there was at least one unfamiliar face – and two Japanese models. Lexus, not a brand typically found competing against the likes of BMW, landed a spot for its new LC500, while Honda also was a finalist for its Civic Type-R. But, in the end, honors went to a classic in the segment, the latest-generation BMW M5. 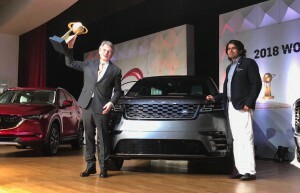 While JLR had to settle for an also-ran in the World Car of the Year category, the British maker’s CEO Ralf Speth was clearly set to celebrate after grabbing the hefty trophy for World Car Design of the Year, the new Velar turning the tables on the Volvo XC60 and the other finalist, the LC500. “This is an unbelievable honor,” said Speth, though clearly not unprecedented. The British marque’s two brands have won design honors four times now. The final award took aim at another emerging category likely to have increasing significance in the coming years. And the trophy for World Green Car of the Year went to the second-generation of the Nissan Leaf. As the automaker pointed out, the first-generation model was the world’s best-selling battery-electric vehicle, with 15,000 orders already on hand for the newest model that has just begun rolling into global dealer showrooms. This entry was posted on Wednesday, March 28th, 2018 at and is filed under Asia Pacific, Auto Shows, Automakers, Automobiles, Business, China, Europe, Land Rover, Luxury Vehicles, Markets, NAFTA, New York, SUVs, South America, U.S./North America, Volvo. You can follow any responses to this entry through the RSS 2.0 feed. Both comments and pings are currently closed.